Ticks that spread Lyme disease are mostly associated with one of their favorite hosts: deer. That's why they're known as deer ticks (a.k.a. blacklegged ticks). But deer aren't the only hosts: These ticks are very fond of mice as well. Ecologists have a pretty clever way of predicting how pervasive cases of Lyme disease might get in a given year based on mouse populations. If the number of mice increases, the ticks feeding on them have more opportunity to be infected by the bacteria in mice that cause Lyme disease. More infected ticks means more trouble for the humans they also latch on to. Because mice were in plentiful supply last year, there’s a more formidable army of ticks ready to transmit the disease this year (95 percent of ticks that feed on mice become infected), according to a report in the Watertown Daily Times. The increased risk appears to correlate with warmer seasonal temperatures, as ticks tend to thrive above 45 degrees. The concern is greatest for Northeast and Midwest states, where 95 percent of Lyme disease cases are documented. Health professionals have long warned about contracting Lyme, which stems from the bacteria Borrelia burgdorferi. Lyme causes fatigue, rash, joint pain, and has the potential for more serious nervous system complications. With the chances higher than usual this year, they’re advising that people take some basic precautions to minimize their risk of exposure. For maximum avoidance, the Centers for Disease Control recommends using insect repellents that include DEET or permethrin on your clothes, boots, or skin, though care should be used when applying it to children. If you’ve been outdoors for any length of time—even just to mow the lawn—it’s a good idea to perform a “tick check,” or a scan of your body for the tiny deer ticks that transmit the illness. 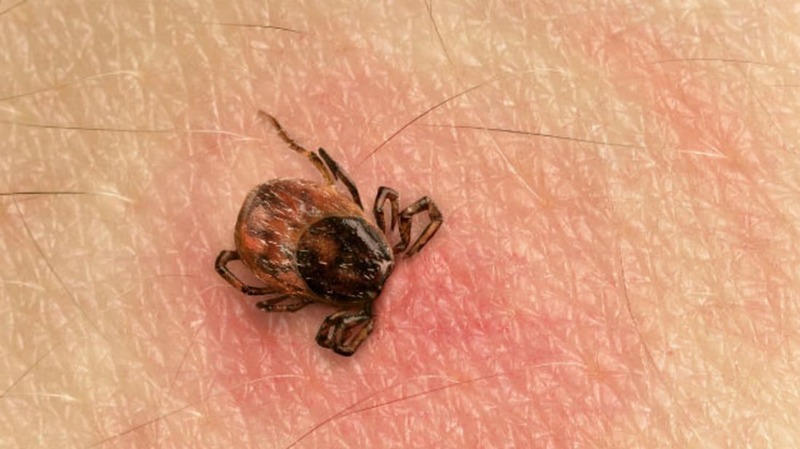 Ticks like to settle in armpits, on the scalp, behind the ears, and even the groin area. They can also be found on clothes. If you find one attached to your skin, try to remove it by grabbing the head with tweezers and pulling upward with steady, even pressure. Since ticks typically need 36–48 hours to transmit Lyme, there’s a good chance you can catch it in time. But if a rash develops around the bite area, it could be a sign of infection and a consultation with a medical professional is recommended. Pet owners need to be especially vigilant, as ticks can hitch rides on dogs during walks. It’s always a good idea to examine your pet after being outdoors, although sometimes ticks or their bites can be hard to spot. The CDC recommends a tick preventative collar in addition to your regular monthly flea and tick preventative: Consult your vet for options, and be careful using any such product on cats, as they can be particularly sensitive to chemicals.